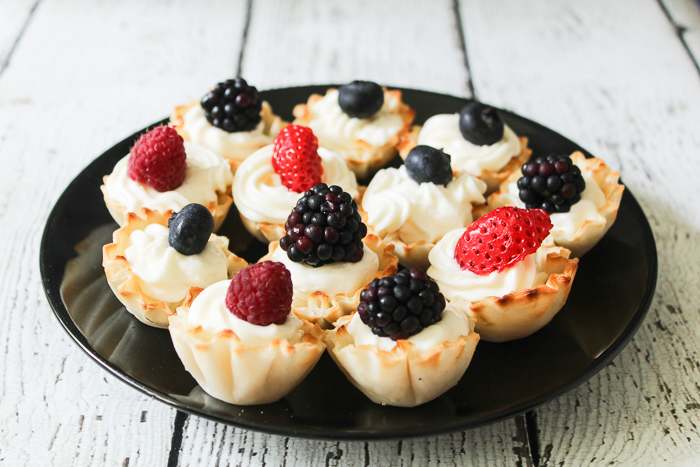 Phyllo Fruit Cups are so easy to make that you will want to make them again and again and again. 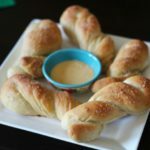 I love phyllo dough when it comes to making quick and easy appetizers. This summer, the grocery store had these in the frozen section and they were precooked and ready to use and on markdown for $1 a box. 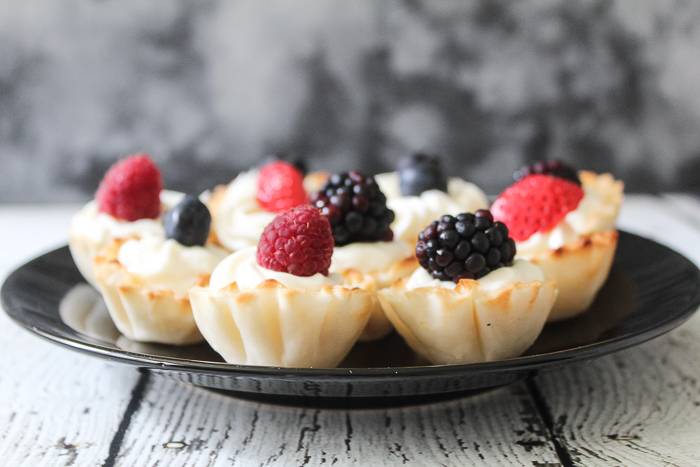 I bought several boxes because I knew I would use them for so many recipes — including this one for Phyllo Fruit Cups. 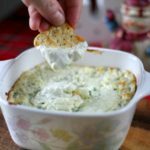 This recipe is an appetizer that literally takes 15 or less to prepare. 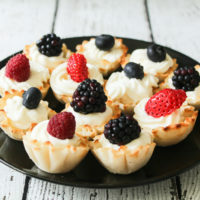 Each bite is filled with sweetened cream cheese and topped with a piece of fresh fruit of your choice. Phyllo dough is so good because it is flaky and it makes the perfect bite for anything. It comes in these cups or you can buy the uncooked version that comes in sheets. The sheets are used for desserts like baklava or for anything you want a flaky, crispy bite for. Start by pulling the cups out of the freezer. It does not take them very long to thaw. While they are thawing, you are going to mix up your cream cheese/powdered sugar mixture. 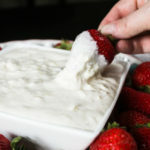 I use the same thing for these as I do my cream cheese filled strawberries. Once you get it mixed up, you can use a piping bag with a star tip or just a spoon and fill the cups. Place them in the freezer for 10 minutes. When you bring them out, top them with fresh fruit pieces like blackberries, blueberries, raspberries, strawberries and more. If your fruit is too big, you can slice them in half as I did with the strawberries. 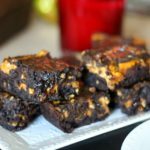 I serve these on beautiful inexpensive platters that I have picked up at the Dollar Tree (can’t beat finding an adorable one for $1), Goodwill, yard sales, and friends who are cleaning out their kitchens. During parties, I never have any of these left, which makes me kind of sad because I love eating these — their like potato chips to me. You can’t eat just one! Print the recipe below and make a batch for yourself. You will LOVE them! These fruit cups take less than 15 minutes to prepare and they are delicious! 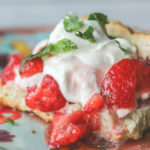 The sweetened cream cheese and flaky phyllo dough go perfectly together. Mix together your cream cheese, powdered sugar, and vanilla together in a mixing bowl. Using a piping bag with a star tip, fill each phyllo dough shell. Place in the freezer for 10 minutes. Remove from the freezer and top with a fresh fruit piece. 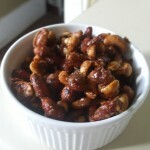 I love making fun snacks like this to share at my parties and get-togethers. 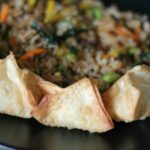 Do you use phyllo dough? 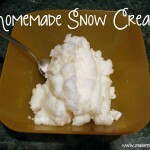 What is your favorite way to use this easy freezer product? I am so bad at making things with phyllo dough. I seem to mishandle it and end up tearing it! That is the beauty of these shells. There is nothing to do to them but take them out of the box. They are already cooked and prepared for you! This looks just the perfect choice for a dinner with a foodie family. Cheers Jennifer, you seem to be a great cook. You had me at 15 minutes! Plus these are so pretty! Doesn’t get much easier or prettier than that! Would look beautiful on my New Years Eve table! Oh wow! 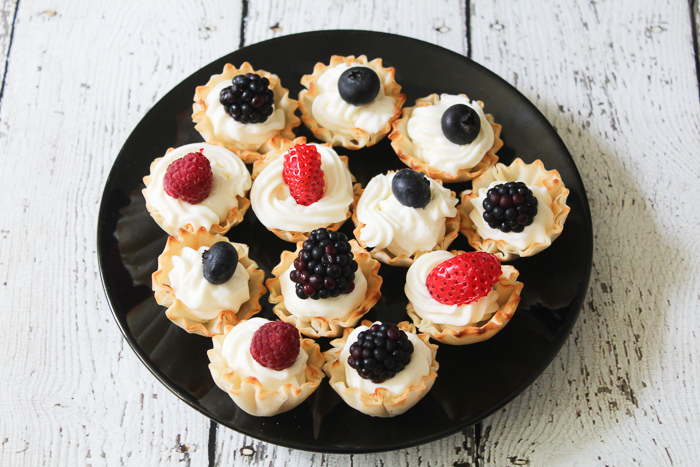 I love how easily these phyllo fruit cups come together! They sound perfect with that cream cheese filling. 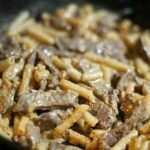 This is such a cute and innovative recipe! 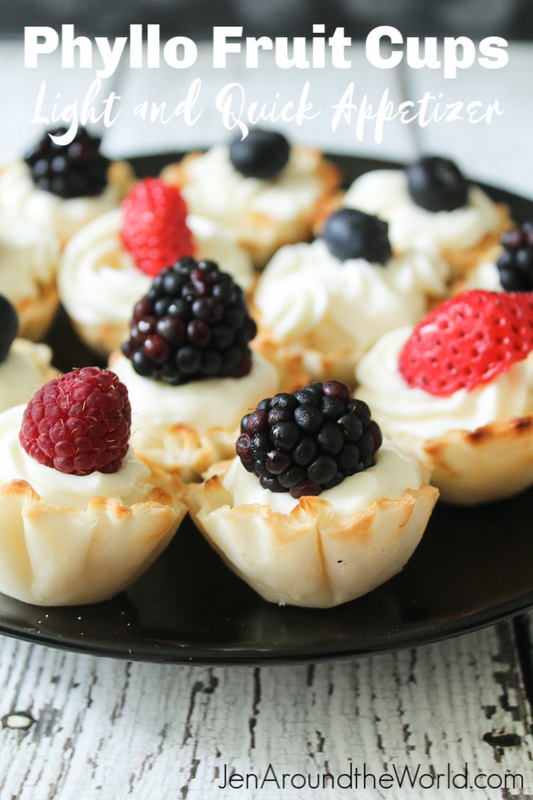 I absolutely love these phyllo fruit cups. 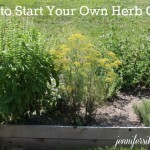 And so easy to make too.